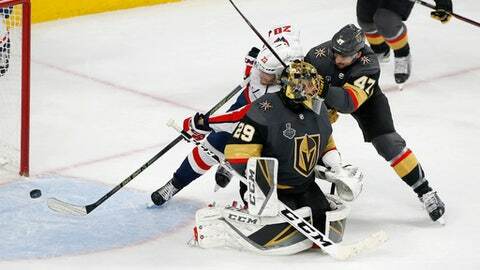 LAS VEGAS (AP) It didn’t take long for Marc-Andre Fleury to fall in love with his new hometown during his first season with the Vegas Golden Knights. ”This organization gave me a chance to play, to play a lot of games, they believed in me,” Fleury said during a news conference to announce the deal. ”The success that we had over the season, winning always makes everything better. And then the fans, how much they supported us right from day one. They were crazy all season long and the playoffs were a lot of fun to play. We could really feel the intensity in the building from the fans. ”When we made the expansion draft play for Marc-Andre, our staff and Dave Prior believed that we could get him playing as well as he’s ever played and even better, and that’s exactly what happened,” McPhee said. ”Dave went to work with Marc-Andre and Marc-Andre was open-minded and worked with Dave and had a terrific season.